The bad news: Home prices and interest rates may be headed higher this year. The good news: Many buyers may benefit from lower tax rates now in effect. Plus, housing deals are available in some markets. Those are the major highlights of a recent report of interest to home shoppers. Yes, it’s true that real estate today can be tricky to afford – especially for first-time buyers. But don’t give up hope. Remember that timing is important. With rates and prices expected to go up, it may be wise to buy sooner than later. Learn the facts and assess the latest data as this can help you make a more informed decision. Home prices and mortgage interest rates should increase across the country in 2018. U.S. housing prices may rise by 2 to 6 percent annually, especially in the entry-level market. The average likelihood of home price declines in the 401 biggest cities remains low – 5 percent. Prices may fall in some areas, like Connecticut and New Jersey. This is due to the weakness of their home price growth and population growth. New changes to the U.S. tax code should benefit lower-cost areas. Ralph DeFranco, PhD, global chief economist with Arch Capital Services, says the major takeaways from this study are clear. But not all the news is negative. This means you may have more after-tax income and could possibly save more for a future home purchase. “This could give you a greater incentive to enter the housing market,” he says. In fact, home prices in about one-third of the largest metro markets are undervalued, per Arch’s Fundamental HVI (Home Value Index) tool. Most are located in the Northeast and along the Great Lakes. New Haven, Conn., is the most undervalued city (15 percent), followed by Chicago (13 percent), Camden, N.J. (13 percent), Hartford, Conn. (12 percent), Worcester, Mass. (12 percent), Lake County-Kenosha County, Ill./Wis. (12 percent), Nassau County-Suffolk County, N.Y. (10 percent), Allentown, Pa. (9 percent), Cleveland, Ohio (9 percent), and Detroit, Mich. (9 percent). Also, it’s good to keep things in perspective. The odds of home value declines are very low in most states. 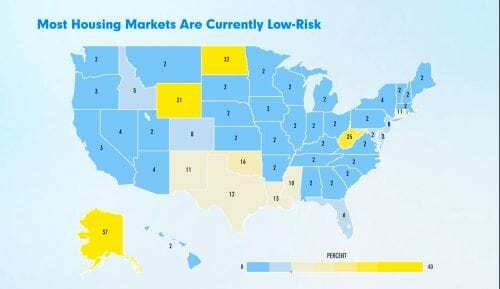 The map below shows the relative risk of price drops in individual states, according to Arch research. “The overall U.S. housing market is still affordable compared with historical norms,” says DeFranco. Interest rates still remain near their all-time low mark, set in late 2012, as well. Based on these findings, DeFranco believes the message is clear. Tamara Dorris, adjunct real estate professor at American River College in Sacramento, agrees. “If you can manage to buy now, you should. Price will always fluctuate in real estate. But it’s always best to invest when interest rates are low and values are creeping upward,” she says. “Real estate is always a smart long-term investment. If you can get in now, you’ll acquire equity faster,” Dorris notes. But if you or your funds aren’t ready, don’t sweat it. “Buyers who aren’t in a comfortable enough financial situation may wish to wait until the time is right,” says Dorris. Improve your credit. “Make sure to pay off all your bills on time and do the basics to improve your credit score. That’s an important factor in determining how much your mortgage rate will be,” says DeFranco. Research what you like and can afford. “Where do you want to buy? Look closely at commute times, schools and quality-of-life factors like parks and food options. 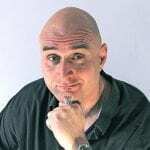 Remember that it’s better to pick a place you will not outgrow, even if it costs more up front,” he says. Turn to a mortgage expert. Talk to a loan professional about different products, rates, terms and options. Get extra help. “Research whether you qualify for any local first-time homebuyer assistance programs,” says DeFranco. Consider a foreclosure home or short sale to save money. “Short sales can be a great opportunity for first-time buyers if they aren’t in a huge hurry,” Dorris says. Current mortgage rates have recently increased to four-year highs. However, they remain at historically highly-affordable levels. And keep in mind that you can somewhat offset the impacts of an overall rate increase by making yourself an attractive mortgage candidate, shopping aggressively for the best rate, and perhaps choosing something other than a 30-year fixed home loan.